Ordering your event products and custom inflatables from Strike Visuals is very simple. Send us a message and a product specialist will be in touch to help you find the products you need at the best price. We have all the templates available for download HERE. …But if you would like for our designers to mock up your design free of charge*, we are happy to do so! Just click HERE to contact us and let us know which products you’d like to see your logo and branding on! Designs that exceed 2 hours in work will be charged an hourly rate. Work will not start on paid design until written/verbal consent is received. 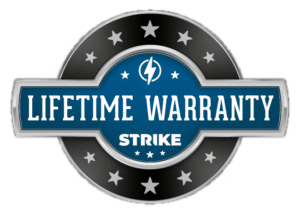 Strike Visuals is proud to offer the only lifetime warranty in the industry on all products. Life happens, reckless employees happen. We get it. That’s why we offer a full LIFETIME WARRANTY* on our table covers! Just contact us if you need to make a warranty claim and our warranty department will get you taken care of.